When asked to think of a stereotypical farm, these aren’t the places most people would picture. Leeches, jewelry, and spider silk–goat’s milk are just a few of the items being cultivated on these funny farms. To outside observers, this farm run by Utah State University may resemble a run-of-the-mill dairy goat operation. But the milk produced by the goats at this facility contains something very special: super-strong spider silk. Spiders produce one of the strongest materials on earth, but farming them in large quantities has proven to be a challenge over the years. To solve this problem, researchers turned to a familiar farm animal for help. The spider-goats are just like regular goats, except for the fact that their DNA has been modified with the gene of a golden orb spider. After the goats are milked, the spider silk protein is extracted and used to make things like incredibly tough body armor, fishing line, or artificial ligaments and tendons. The products Ed Currie grows on his South Carolina farm are not for the faint of heart. Of all his specialty hot pepper crops, one in particular stands out: the Carolina Reaper. It holds the distinction of being not only the hottest pepper on the farm, but the hottest in the world. The pepper, which was bred by crossing a Pakastani Naga with a Red Habanero, can reach up to 2.2 million Scoville heat units. To give that some perspective, a jalapeño measures in at 5000 units and pepper spray at around 2 million. The Carolina Reaper first gained notoriety in 2011 when an NPR reporter “ate a small piece of the pepper, rolled around on the floor, hallucinated and then shared his experiences with the national media,” according to Currie's website. It was awarded the Guinness World Record for World’s Hottest Chili two years later. Pearls form when an irritant finds its way inside an oyster and becomes coated with the mineral substances that make up its shell. Instead of just opening wild oysters at random and hoping for the best, pearl farmers have come up with a way to expedite this process. On pearl farms like Kamoka Pearl—which is located on Ahe, a French Polynesian atoll—oysters are kept in protective nets or baskets hung on lines anchored off shore. When an oyster is large enough, a worker will pry open its shell and slip in a bead or “nucleus” for the pearl to form around. Even though most pearls are farmed in places like Japan, China, Australia, and Tahiti, the nucleuses are traditionally made from the shells of mussels [PDF] from the Mississippi River basin, which are the ideal size and thickness for pearl-growing. Bird’s nest soup—literally soup made from the nests of swiftlet birds—is considered a rare delicacy in parts of Asia. Diners are willing to shell out up to $100 for a taste of the stuff, which is essentially just a bowl of bird spit. The nests are traditionally harvested from high atop the walls of caves, but many people are beginning to find more resourceful ways to collect them. In Indonesia, multistory buildings in urban areas are being modified to house swiftlet bird farms. The upper stories of the buildings are riddled with entrance holes, and swiftlet song recordings, insects attractants, and certain scents are used to draw wild birds in. While many see swiftlet farms as the answer to the industry’s over-harvesting problem, their urban locations may be a health hazard to residents nearby. Sadly, these farms don’t actually grow pizza like the name suggests. They do, however, specialize in all the ingredients needed to assemble a pizza from scratch. Most pizza farms produce their own herbs, wheat, tomatoes, and dairy, and some even go so far as to grow the timber for their wood-burning ovens. And in case their theme isn’t obvious enough, some farms divide their crops into “slices” to resemble a pizza pie from above. If you’re interested in visiting one of these places, there are several pizza farms in the Midwest where agrotourists can go to enjoy homemade pizza made with ingredients sourced from the property. Attempting to milk a moose sounds like a recipe for disaster. But in Russia, there’s an entire farm dedicated to sourcing dairy from these antlered behemoths. The farm opened in 1963 with two calves, and has since fostered over 800 moose. Today, Sumarokovo Moose Farm provides milk to the nearby Ivan Susanin Sanatorium, where it's used as a treatment for peptic ulcers and other conditions. The milk contains an enzyme that’s believed by some to kill ulcer-producing bacteria (but according to many doctors, milk might actually make ulcers worse). 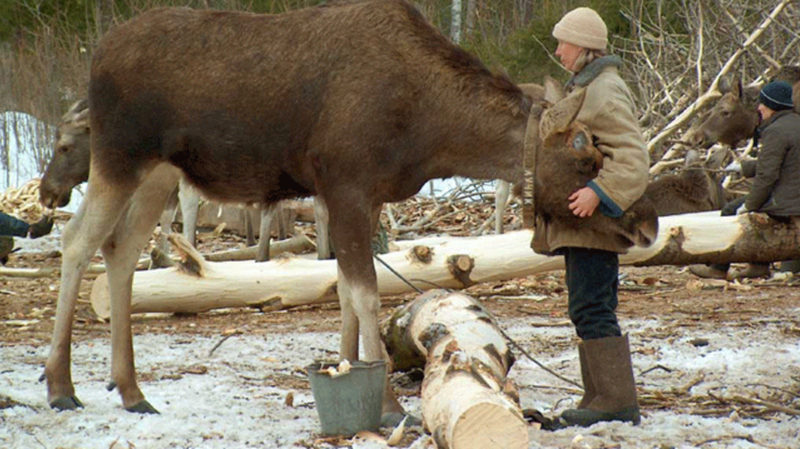 For anyone looking to see a 600-plus-pound moose get milked in person, the Sumarokovo Moose Farm is open to tourists. The harsh, southwestern desert doesn’t seem like an ideal place buy farmland—unless, of course, you’re planning to grow cacti. In addition to being the spiny plants we all associate with the Old West, they’re also a lucrative crop. Nopales, a.k.a. prickly pears, were the sixth most popular vegetable in Mexico in 2007, accounting for $150 million in sales. Farms like Red Rock Ranch in California and in Bach’s Cactus Nursery in Arizona both have cacti crops that span several acres. Medicine has come a long way since the days when leeches were considered a cure-all by doctors. Still, many parts of the world continue to practice leech therapy as a common treatment for a variety of conditions. To meet demand for the bloodsuckers, there are facilities around the world dedicated to breeding, hatching, and raising the animals. The International Medical Leech Center near the Russian capital of Moscow produces up to 3 million leeches a year. According to the LA Times, the operation once provided the leeches Joseph Stalin used to treat his headaches and depression. Fortunately for them, the dictator responded well to the treatment and the farm remained open.